Florida beaches are beautiful, that’s pretty well undisputed. But there is so much more our fair state has to offer! If you’re interested in relaxing, there’s no shame in rolling out a beach towel and soaking up some rays. For those of you who crave a bit more excitement, however, jet ski tours give you a chance to feel the wind in your hair and the spray of the surf as you cruise the scenic vistas around Key Largo. Whether you’re a local looking for a fun way to spend the day or you’re visiting from out of town, hopping on a jet ski is a great way to get out and explore the area. Before you set out, however, it’s important to stop and do a bit of planning to make the most of your day. 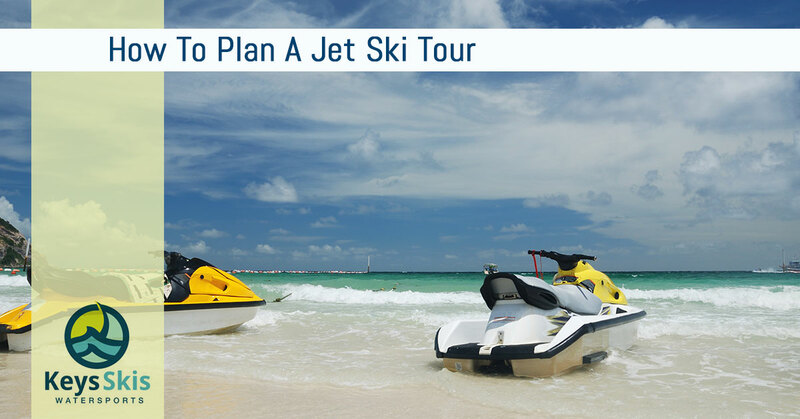 Start with these tips to help plan your next jet ski tour. First things first, you can hardly enjoy a jet ski adventure without the jet skis! Spring break and summer can be pretty busy times for jet ski rental companies, so if you have a limited window, be sure you reserve your ride as early as possible. At Keys Skis & Adventure, we make it easy to find your ride any time, from anywhere. Just use our handy online reservation portal to find the right day and time, choose the number of jet skis for your group, and book your adventure. Key Largo and the other Florida Keys offer a pretty diverse range of different areas to explore. Do you want to head out toward the Atlantic Ocean, or would you prefer to explore the Gulf of Mexico? Would you rather experience riding along open water, or do you want to head inland and cruise amidst the mangroves? Make these primary decisions first so it’s easier to find pathways or chart a course. If you want to cruise to a combination of destinations, that’s absolutely doable. However, if you’re going to plot your own journey, you’ll want to keep a couple of things in mind. First, be sure you aren’t intending to travel anywhere to narrow or shallow for the jet ski to traverse. And second, keep your time limit in mind; don’t plan a course that will take hours longer than your reservation. If you want guidance, just give us a call. We’re pretty darn familiar with the waterways around Key Largo, so we’ll be happy to give you advice. No one wants to lose their expensive designer sunglasses to the ocean. Before you arrive for your jet ski reservation, gather a few handy items to minimize hassle. This includes things like a waterproof protective pouch for electronic keys or phones, sunglasses cords so specs don’t go flying away, proper sun protection measures, and secure water-friendly shoes if you don’t want to go barefoot. Want to learn more about jet ski rentals and jet ski tour options? The Keys Skis & Adventure team is here to help. Contact us online or give us a call to start planning your next adventure around Key Largo!